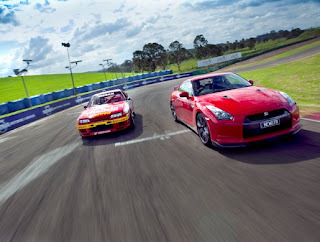 Long ago, in a galaxy far away, Nissan GT-R's competed on a road course against other touring cars. Or actually that is a isolated country far away, the Nissan Skyline GT-R, R32 competed in Australian Touring Car. Eventually the series would become V8 Supercar, with the Australian Domestic Market Fords and Holdens(GM). No word on which Nissan(sedan?) they will be racing, or exactly which engine they will be using, although there are a few choices that are already used in Super GT, and FIA GT1. In Australia, V8 Supercar has been a two make series since 1993, when the Nissan Skyline GT-R was banned after dominating in 1991 and 1992. Like NASCAR with the Car of Tomorrow (COT), V8 Supercar has its Car of the Future. The cars saw several changes in NASCAR(lost the wing, splitter), we will see how things pan out for V8 Supercar. 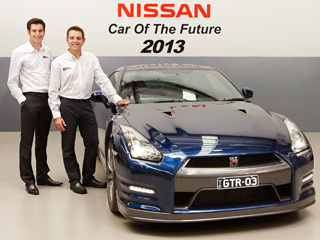 Research has shown that fans wanted to see Nissan return as the third brand. 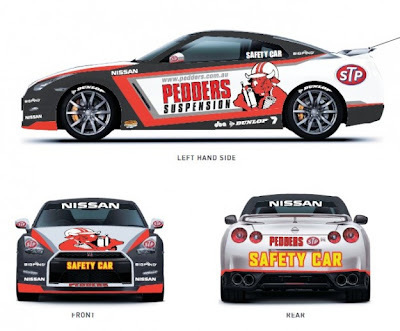 The Japanese brand today confirmed it would enter the V8 Supercars championship in 2013, returning to the sport from which it was banned in 1993 after its all-wheel-drive GT-R coupe dominated the series in 1991 and 1992 to earn the nickname ‘Godzilla’. The chairman of the V8 Supercars commission in Australia is Mark Skaife, who co-drove Nissan Skyline GT-R's in Australian touring car. Check out the 1990 Nissan Motorsports Promotional Video from Australia after the break.